Grand Hotel Kempinski High Tatras is an oasis of luxury on the shores of a glacial mountain lake, overlooking the majestic panorama of the High Tatras. Štrbské Pleso [Štrba Tarn] is the most beautiful Slovak alpine lake, situated at an elevation of 1,351 meter (4,432 feet) above sea level. 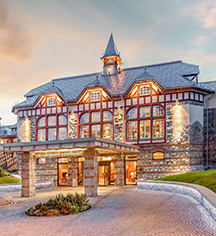 Grand Hotel Kempinski High Tatras, the former treatment complex of Hviezdoslav, consists of three parts, all of which were established in different periods between 1893 and 1923. 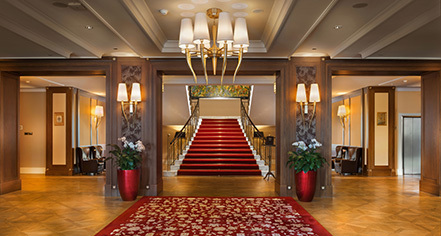 Thanks not only to its location, but also to its 98 luxurious guestrooms, including 22 luxury suites, conference spaces equipped with state-of-the-art technology, and one of the finest and most beautiful spa facilities in Europe with 1,300 square meter (14,000 square feet) of floor space, the hotel can be used year round, thus eliminating low seasons. These amenities help the hotel rank among the world’s most exclusive resorts in the Kempinski network and ensure its position as the unequivocal leader in Slovakia’s luxury hotel market. Grand Hotel Kempinski High Tatras, a member of Historic Hotels Worldwide since 2017, dates back to 1893. The hotel wine cellar is home to more than 300 wines of excellent quality. The pride of the cellar is perhaps the largest collection of famous vintages from the Château Petrus Pomerol area, where prices start at €8,100 per bottle. Cancellation Policy: Cancellation policy varies depending on rate or package booked. Extra Person Fees: EUR 75 per night. Rollaways: Available upon request; EUR 75 per night. Parking: Off-site parking is available; rates apply. Payment: Cash and credit cards are accepted. Pet Policy: EUR 15-35 per night; dogs only. Grand Hotel Kempinski High Tatras is an oasis of luxury on the shores of a glacial mountain lake, overlooking the majestic panorama of the High Tatras. Štrbské Pleso [Štrba Tarn] is the most beautiful Slovak alpine lake, situated at an elevation of 1,351 meter (4,432 feet) above sea level. Learn more about the History of Grand Hotel Kempinski High Tatras .